Constructed of high strength (55,000 PSI) Steel for long life. Beveled edges on both ends permit smooth entry and exit. Deck is checkered for safe efficient use. Locking legs minimize ramp movement. Available in widths of 60", 72" & 84". Capacities range from 10,000 to 30,000. 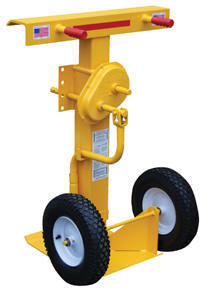 Standard with lever lift for help with portability; optional pickup chains. Locking legs are uneven to allow the dockboard to sit canted for easier pickup by forklifts, when picking off the floor. 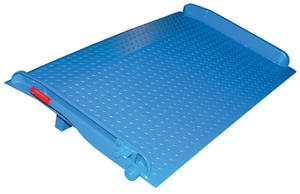 Trailer Stabilizing Jack - Rachet Beam Type - 39-1/2" to 51" Economy Trailer Stabilizing Jack - 41" to 57-1/2" Loading Dock Overhead Door Warning Barriers - 8' Wide x 8' High Usable E Track Cargo Bars - One Piece Aluminum - 85" to 96"